Jamal Khashoggi was one of several reporters named in the award, along with Filipina journalist Maria Ressa and Reuters’ Wa Lone and Kyaw Soe Oo. The Capital Gazette, the Maryland media company that lost five staffers to a mass shooting in June, was also featured.” data-reactid=”17″ type=”text”>Slain journalist Jamal Khashoggi was one of several reporters named in the award, along with Filipina journalist Maria Ressa and Reuters’ Wa Lone and Kyaw Soe Oo. The Capital Gazette, the Maryland media company that lost five staffers to a mass shooting in June, was also featured. Time editor in chief Edward Felsenthal noted that it was the first year the weekly newsmagazine chose someone who is no longer alive. 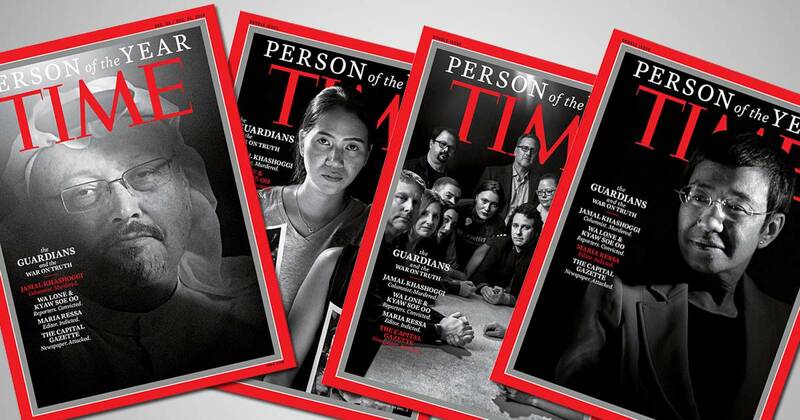 Time’s annual Person of the Year feature profiles an individual or individuals who had the biggest effect ― for better or worse ― on news headlines over the previous 12 months.